When I was growing up, Pinoy movies would be “copycats” of Hollywood Movies, whether they were about love, comedy, horror, thriller or action-filled movies. Action movies would revolve around fighting for justice, revenge, “cowboy” stories, secret agent stuffs with unbelievable gadgets, and lots of fighting, whether they armed or unarmed combat fightings between the main character with the rest of the cast. Lately, Pinoy movies would deal on love triangle, betrayal of trust, and other social issues prevalent in the country or in any community or society. Sometimes, it would depict a fight or conflict between the rich and the poor families with an ending that gives some moral lesson to the viewers. Whether they are action, thriller, love story, or comedy movies, the viewer can easily depict the ending of the movie. I think that since the early 70s, I started to draw myself to Hollywood Movies and did not had an opportunity to watch Pinoy Movies. However, I would watch some of the action movies of FPJ where he portrays being a policemen, a soldier, or simply somebody who defends those who are oppressed. After 40+ years, I was tempted to watch a Pinoy movie. 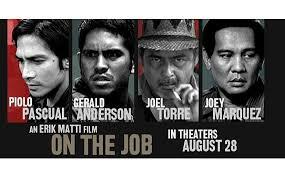 The movie “On The Job” is completely a different genre of a Pinoy Movie which was brilliantly and perfectly presented from a story that is based on actual events. The movie portrays a “rotten and corrupt” system from the top of the government up to the very basic unit of the society which is the family. In between such spectrum, we have the law enforcement agencies; the prison system; and the convicted felons serving their respective sentences inside the prison. Generally, the story revolves around an old and young prisoners who are “hired contract killers” who could get out and in the prison with ease when they are ordered to “hit” their target. The “twists and turns” and climax of the story are very jolting to one’s senses and differs from the mind conditioning that we expect for a much favorable ending of the movie. It will keep your mind asking for answers for the “why” such things happened in the movie story. There might some small “flaws” and inconsistencies on the characters and the technical aspects of the movie but they are not significant to affect the general story and message it wants to share to the viewing public. The movie is simply outstanding and it strikes to the very core of our “problematic” society and corrupt system of governance. If you ask me why I am doing a movie review in a runner’s blog? It is because the prisoners, with their lack of better nutrition, training, and physical conditioning system, are better RUNNERS and SHOOTERS than the law enforcement personalities portrayed in the movie story. With the things that are presently happening in the country right now, I just wish that our political leaders and the institutions that are part of the justice and penal system of the country will be able to see this movie and serves as their “mirror” and maybe, do something to correct the “rotten and corrupt” system. If a policeman would be able to pay for his “banana cue” from a poor lady looking for an income for her family, then, that would be a good start to correct the situation we are in. I actually like Pinoy films. Watch them when I can. This one sounds really interesting. Hopefully I can get my hands on it here.